"Only Celtic, Ajax and PSV had won the treble before, and that was Jock Stein's Celtic and Cruyff and Michels' Ajax - two of the greatest sides the game has ever seen. And Fergie was no Stein, and he was certainly no Michels... Or so we thought until the evening of May 26, 1999." May 26, 1999 - Manchester United 2-1 Bayern Munich. Camp Nou. Manchester United 1998/99 - It's the greatest single club season of all time. They weren't as dominant as Bayern in 12/13, nor were they nearly as good as Barcelona in 10/11. Arsenal's invincibles and Mourinho's first Chelsea campaign were more impressive league performances while Jock Stein's 66/67 Celtic were the first to win the treble. Instead, Manchester United in 98/99 was an odyssey of Homeric proportions. Epic moments and fairytale storylines at every turn, I've often heard such phrases as "It was meant to be" or the word "destiny" used to describe United's treble season. Such phrases are of course complete nonsense. The more fitting phrases to describe Man Utd's 98/99 season are to do with fat ladies singing, counting unhatched chickens and "making your own luck". They won the league on the last day, and the FA Cup storyline is just a remarkable as their Champions League one - A smash and grab victory against Liverpool, Patrick Vieira passing to a rather hairy Welshman and then an exhibition against Newcastle in the final. They did have a fantastic squad, arguably Fergie's best, and would have been expected by most to win at least one major trophy that season. The Premier League was seen as a formality, the FA Cup as an added bonus, while the Champions League was an almost fictional prospect - no English side had even reached a European Cup final for 14 years. All three however was impossible. Only Celtic, Ajax and PSV had won the treble before, and that was Jock Stein's Celtic and Cruyff and Michels' Ajax - two of the greatest sides the game has ever seen. And Fergie was no Stein, and he was certainly no Michels. Or so we thought until the evening of May 26, 1999. Both United and Bayern's run to the Champions League final that year had been thronged with drama in almost every game. They both came from the same group, which also contained a Rivaldo and Figo inspired Barcelona and Danish side Brondby. United had scored and conceded almost at will in the group stage. Two thrilling 3-3 draws with Barcelona, two more draws against Bayern and two thrashings of Brondby were enough to see them through in second place, one point behind Bayern. Bayern, who had their best side since the glory days of Beckenbauer, brushed past Kaiserslautern in the quarter-finals before beating Dynamo Kiev 4-3 on aggregate in the semis while over in Turin Roy Keane, after being booked and watching United implode in 15 minutes against Juventus, single-handedly inspired a 3-2 comeback. At this point the narratives of fate and destiny were being reported both in England and Germany, as both sides were still gunning for only the third treble in history. United had already won the league and FA Cup while Bayern were to play in the DFB Pokal final in June. This wasn't a David vs Goliath contest, but rather a Goliath vs Goliath one. Alex Ferguson's multi-national side against Ottmar Hitzfeld and the backbone of German football - two of the best teams ever, two of the best managers ever, two of the best goalkeepers ever, and all of them kept in control by the best referee ever, Pierluigi Collina. Mario Basler scored an early free-kick. Then Bayern sat back and counter-attacked for 85 minutes. After 71 minutes Mehmet Scholl chipped Schmeichel and hit the inside of the post. Ten minutes later Carsten Jancker mistimed a bicycle kick by a millisecond and hit the underside of the bar. United had been outplayed from the very first minute, an exhausting season caught up with them and the Germans exploited the lack of the suspended Keane and Paul Scholes in central midfield. As the years have gone by it's not the scenes of United euphoria or Bayern despair that is remembered by the neutral, nor are the goals themselves. The greatest three minutes in Manchester United history have always best been remembered by the timeless words of ITV commentator Clive Tyldesley. "Is this their moment? Beckham... In to Sheringham. And Solskjaer has won it!! Manchester United have reached the promised land!" 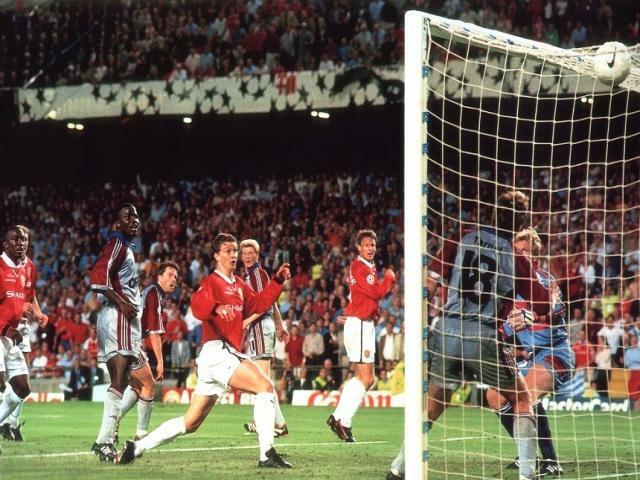 While Tyldesley words will echo in eternity and Solskjaer's right toe and bewildered expression will always be the defining image of the night, the most poignant and heartbreaking part of it all was the reaction of Bayern's players. While Schmeichel was doing cartwheels at one end and the cameras were focused on Solskjaer's celebration, the Bayern penalty area was strewn with despondent bodies. Michael Tarnat slumped against one goalpost and Scholl against the other. Oliver Kahn lay on the goal-line gazing into the distance. The tears flooded from Jancker, but the most despairing image of the night belonged to Ghanaian Samuel Kuffour. Screaming, he banged his arm against the Barcelona ground a number times, while Collina, the referee, attempted to drag him to his feet so Bayern could play out the last few seconds. It is the most heartbroken I have ever seen a group of sportsmen. Bayern were to get their redemption two years later against Valencia, where this time Kahn played the father figure to the broken Santiago Canizares. As for United, this was the defining moment in their post-Munich air disaster history. It was the difference between a great era and the greatest club era of all time and the difference between a great manager and the greatest manager of all time. This Week in Football History: Bayern, Schalke, and the four-minute championship. This Week in Football History: Le Tissier gives The Dell a fairytale send-off.